Manish Arora showcased his Ready-to-Wear fall-winter 2016 collection on the 3rd day of the ongoing Paris Fashion Week. It was the usual fuchsia fair and bold prints that dominated the collection. 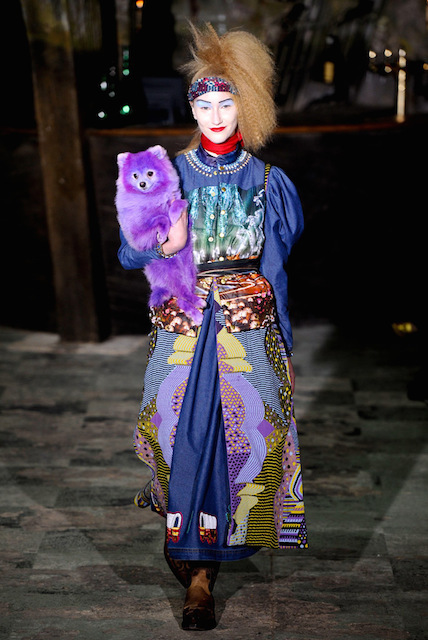 Manish Arora had some celebrities on the ramp this time, like Chantal Thomass and Ellen von Unwerth and also a purple Pomeranian clutched under the arms of a model. Manish Arora’s RTW fall 2016 collection bore the influence of the ‘Native American’ look with blanket like throws and head bands. Furry Rodeo boots were cool and so were the creations crafted out of enzyme washed denim. Buttoned skirts and Prairie skirts with intricate thread work and prints. John Galliano on the other hand was absolutely fabulous with his RTW Fall 2016 collection for Maison Margiela. 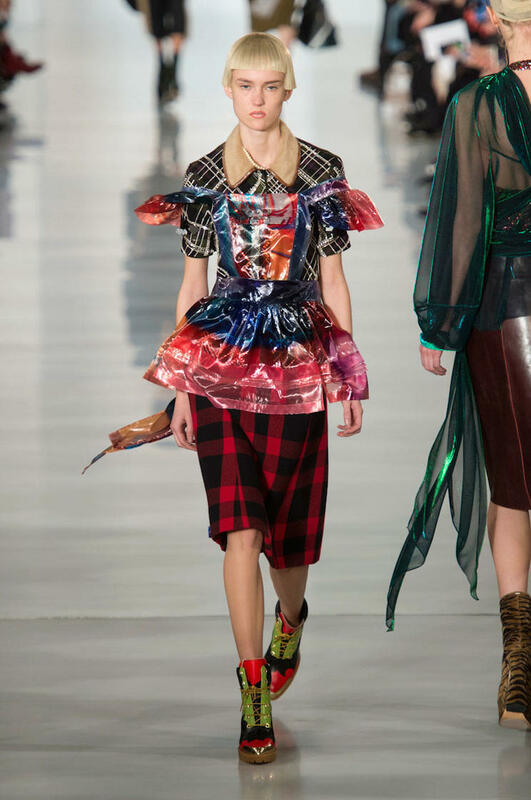 It was the freshness and the unexpected element that Galliano brings in with every collection that makes him win. This time Galliano took to the classic feminine silhouette and deconstructed them in his avant-garde style to present a magnificent collection. The woolen arm-warmers, kitchen apron worn over check skirt-suit, scarves twisted around and knotted as huge bows and huge Rococo belt buckles were absolutely eye-grabbing. 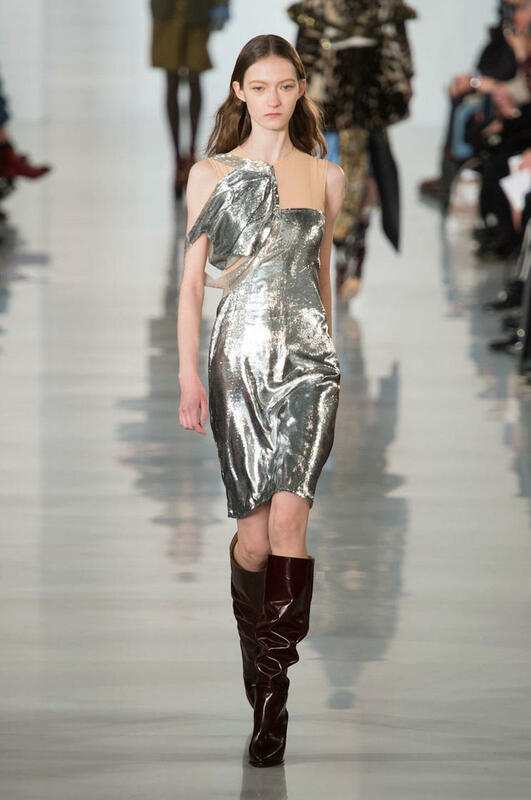 Be it the ribbed knits, or bold Tiger prints or Khaki or shiny Lurex, John Galliano mixed and matched fabrics and juxtaposed classic shapes with deconstructed eccentricity to show a really fashionable collection for Maison Margiela. Now I look forward to Rahul Mishra’s RTW, Fall 2016 show on the final day of Paris Fashion Week.